YBATS Book — Stephanie Marango, M.D. Since ancient Greece, astrology has been part-and-parcel of healthcare; even Hippocrates, considered one of the founders of modern medicine, consulted the stars as a guide. Since then, astrology has played a prominent role in the history of science and medicine. Your Body and The Stars takes this ancient understanding and connects it to modern concepts of health and wellbeing. The result is a fun, practical, and insightful guide that takes a stellar approach to wellness. Do you suffer from neck pains? Go to the chapter on Taurus and the neck. How about sore knees? Learn preventive tips and exercises in the Capricorn chapter. 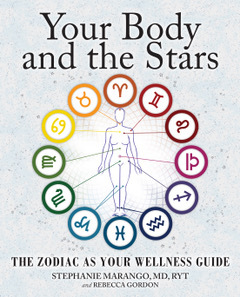 Your Body and the Stars is the first comprehensive reference guide to go deep into the twelve zodiac signs and the specific body region each sign represents—from your head (Aroes) down to your toes (Pisces). You can utilize this book by identifying either your zodiac sign or body region that needs healing attention. Each chapter integrates a self-directed program and holistic approach to health for your biopsychospiritual wellbeing; practical end-of-chapter tips, questions, and illustrated step-by-step exercises based on a mix of yoga, stretch and strengthening movements, and Pilates are provided for all levels. Enjoy a new perspective of your body with practical tools to address it.